In a word: Madison's Mexican comfort food. JM ate the fish tacos with a lemonade. John ate the cheese enchiladas and a Diet Coke. Nichole ate the smoked chicken Caesar salad and a Diet Coke. Rose ate the chicken and cheese enchiladas and a Diet Coke. We split a cheesecake chimichanga. The bill was $42, or $10.50/person, plus tip. Everyone gave Laredo's an A (see our grading rubric). Let's get one thing straight: we know that by giving Laredo's straight A's, we're inviting flak from all sides - from the foodies who'd never set foot there, to the bargain hunters who remember when you could get twice the volume of tortilla slop in red sauce for half the price. We stand by Laredo's because it's wildly successful at what it sets out to do, which is to profit from providing decent, consistent Mexican food, fast, and fairly cheaply, to the average Madisonian. The speedy, friendly service at Laredo's is a hallmark of the establishment. You rarely have to wait for a table except at the height of the lunch rush, and you can almost always expect the manager to check in on your meal with a warm, "How is everything, amigos?" Your glass is never empty - even their rich, creamy horchata can be had by the pitcher. The omnipresent murals, though unchanged through the years, remain bright and cheery. These cheese enchiladas are typical of Laredo's menu. Both Rose and John enjoyed them, as usual; John would normally have gotten the beef fajitas, which can feed an army, but concessions for Lent had to be made. JM's Lenten purchase, the fish tacos, were good enough to consume year round. They were delicious, rich and gone. The grilled tilapia fillets, tender to the tooth and absorbent of the sauce, were far superior to fried version. The crema on the side, a cold, sour cream base with dill and chili powder, was quite fantastic, reminding JM of salsa and tartar sauce simultaneously. Nichole's smoked chicken Caesar salad was a winner as well. 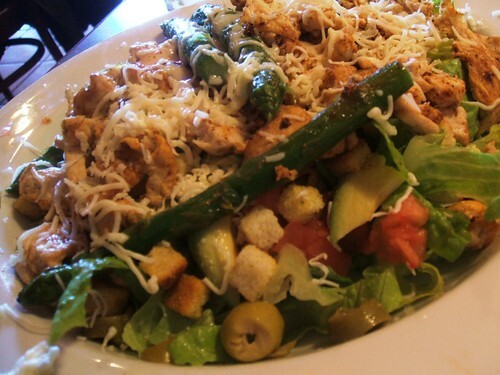 Admittedly watery shredded romaine and commercial croutons were the least thrilling parts; but those were just a vehicle for toppings of grilled asparagus, avocado, green olives, diced tomatoes, and a generous amount of smoky chicken and cheese. The salad didn't come with dressing but didn't need it. Even if JM's fish taco sauce hadn't been there for illicit fork-dipping, the house salsa made a good dressing, complementing the salad's fresh, clean, simple flavors. Enchiladas Poblanas - chicken mole, Nichole's standby, done in a rich dark sauce. Fajitas jardin - another simple (if unabashedly inauthentic) winner: a veritable mountain of non-greasy asparagus, zucchini, broccoli, carrots, mushrooms, onions, bell peppers, and tomatoes, served with Laredo's smooth beans and (natch) all the tortillas you need. Tortilla soup - a spicy tomato-vegetable base garnished with crunchy strips of chips. Enchiladas Campeche - the only way to pull off the combination of shrimp, scallops and beans; queso Oaxaca and cilantro tie it together (though the chipotle adobo sauce can be hit or miss). Enchiladas Sonora - smoked chicken, spinach, and poblano peppers in a creamy green sauce with sour cream and queso fresco. Any of the quesadillas (but especially the Rio Bravo seafood version) - the next time you need to dispel your daily sorrows with a grilled cheese sandwich, use this nuclear option and coast through the afternoon on a cloud of warm queso goodness. There are some things to be missed at Laredo's. The chiles rellenos always seem to be overcooked and their filling is nothing to write home about. In almost any chorizo dish, the sausage's primary contribution is not porcine goodness but a gritty texture. And if you're looking for health food, move on - you have to put up with salt and fat to enjoy your meal here. We're not ashamed to admit that we're Laredo's regulars. It's our favorite Madison comfort food. 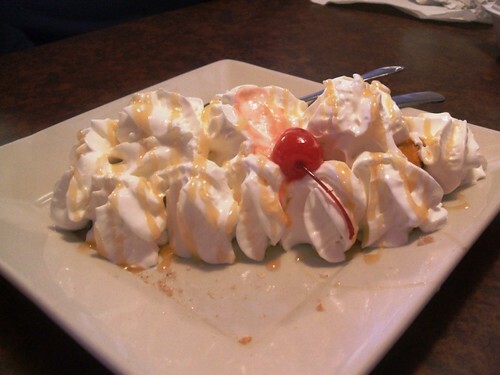 We always leave full and happy, wallets intact, with or without dessert. "Floating on a cloud" might not be the best way to pleasantly describe a Mexican restaurant. Would that every restaurant had this level of advocacy laced throughout the review! The one-meal-review concept appears to have gone out the window for this one. I will say, though, that I'll give Laredo's another try on the strength of your fervent evangelizing. But I have been distinctly "meh" on Laredo's so far. Anyone who forces himself/herself to avoid or fail to enjoy Laredo's simply because it's Laredo's can starve. I always find their chiles rellenos pretty damn good, for the record. 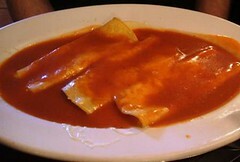 I adore Laredo's enchiladas too.... Love the cozy friendly atomoshere as well.. I've only been to Laredos once when they first opened and wasn't very impressed. With all the new, much more authentic, Mexican restaurants springing up all over Madison, I doubt I’d try it again. But that’s just me. What I find curious is that I've seen in other reviews on this site where Laredos is used as the standard to compare other Mexican restaurants in Madison. I see this as a bit of a problem right off the bat, as this is described as a Tex_Mex place, which is different than other varieties of Mexican food. Also, I notice that, in your reviews, you skipped over El Pastore on Park Street, which for a long time, was probably Madison’s most authentic Mexican Restaurant before all the new comers started opening up, and may be a better choice to use as a standard than Laredos. El Pastore may not be the best, but it’s a pretty good starting point. 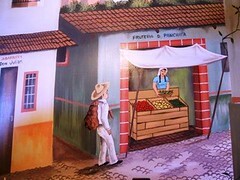 The full name of the place is Taqueria El Pastor, so they'll get there eventually. In the meantime, Laredos has been open for a decade now and is only getting more popular. Why not give them another shot? "The full name of the place is Taqueria El Pastor"
Ah ha! That explains it. You may not want to wait until you get around to the "T's" to try it just for yourself. The $2.50 Dos Equis on tap alone is worth the trip. I believe they're $1 on Monday nights. I imagine I'll wander into Laredos again at some point since it's in the neighborhood. this restaurant is great. a lunch stop takes no time at all, your food is there before you fill up on the chips. 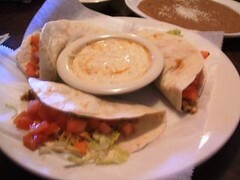 i highly recommend the quesadilla azteca - delicious!!! I love you guys. But I do not love Laredo's. I give them a D at best. I recently visited Laredo's per this reveiw to give it another chance. Two very bad past experiences, this time was no different and I would not call it decent. It was horrible. Processed cheese wrapped in dry corn tortillas, covered with tomatoe soup. That is not what I would call enchilada's and my friends greasy over cooked chicken with cardboard is not what I call fajitas with tortillas. There must be some agenda here. They have gotten very expensive and cleanliness is an issue. I give it a D-. I agree with J. Lopez... have been there twice, both times uninterested in finishing my meal. Stale tortilla, bad cheese, bland sauces... go to Taqueria El Pastor or Taqueria Guadalajara for a tastier, more authentic meal. Heck, you can do slightly better just down the road at Casa del Sol. I'll admit, I've been a Laredo's fan for a while. But I still have to say their new menu items are quite impressive and inventive. I order salads at Mexican restaurants on occasion, and the new tesoro ensalada is amazing. The chicken to greens ratio may be tipped a bit too much to the chicken side; but its very good. And asparagus, cucumber, tomato with a raspberry dressing that works in an unexpected way. Two solid meals from a $9 salad seems very fair to me. Sorry, but I think the Laredo's enchiladas are disgusting. It's like they microwave chicken, tortilla's, and sauce seperately and then assemble them before serving. Even the picture (above) makes them look horrible. Pasqual's is my go-to place for Mexican (but not the Hilldale location). My husband and I used to love Laredo's (East side). In the past year or so we have tried the West and University Ave. locations and they were absolutely terrible. On both occasions the food was bland and drenched in whatever sauce came with the dish (cheese, flavorless salsa, etc). The University location was so bad I didn't even finish my meal. It's really depressing to see a good place go bad. There are enough Mexican restaurants in Madison to not even give this one a chance. yea - what's up with that University Ave one? You'd think they'd all follow the same recipes - but that one is notably worse than the other two. The east side one is still the best, but even that one is notably worse than any real taqueria in Madison, and they're using cheaper ingredients than in years past. I've been to the University location once and found it to be pretty similar to the other ones, in that it wasn't too good. Laredos is average mex food at best. it is consistent though and the service is good. Never see the owner there any more. Miss the little pitchers of salsa. But still love the place.